FliQ beta for iOS is now available for download for free from the ﻿iTunes store﻿! While the world has become ever more connected with the number of social networks and ways to communicate increasing every day, the ability to share contact information in the real world has not kept pace with online communities. FliQ will change that! FliQ uses magic to send contact information between two phones or devices, without WiFi or cell data, instantly. From Facebook and LinkedIn, to your e-mail and phone number, you choose what to send, what to keep, and how to connect! Decide what information you want to share. 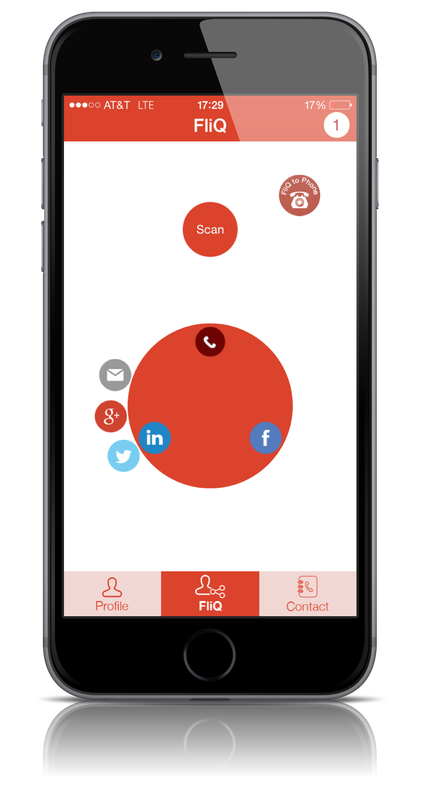 If they have FliQ, you can scan! You decide what you want to share! If your new friend does not have FliQ, no problem! Just select the FliQ to Phone feature and FliQ will send a hyperlinked text message to them! If someone FLiQs you, you decide what to keep! You can keep everything, somethings, or nothing. You are in control!